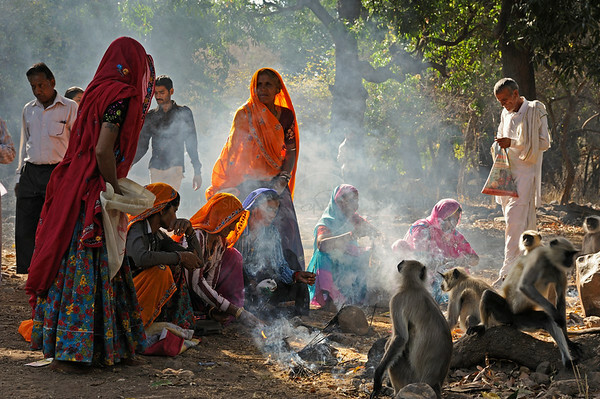 The population around the Ranthambhore tiger reserve is mainly agriculturist, pastoralist and labour class, dependent upon the natural resources of the reserve. The tiger reserve has some negative impacts on the population of the adjoining settlements, such as, raiding by wild animals, live stock kills etc.. There is a general feeling among the people that the very existence of reserve is creating serious problems in the development of the area. Based on the above-mentioned factors, the Zone of Influence (ZI) of reserve is "tentatively" identified as an area within 10 Kms radius of the legal boundaries of reserve. There are 4 village inside the Ranthambore National Park, 15 villages inside the Kela Devi sanctuary, 4 villages inside the Sawai Mansingh sanctuary & 3 villages in Sawai Madhopur sanctuary. These villages are part of Core and Buffer zone and are situated inside the reserve boundaries. The ZI outside the reserve maybe further divided into two parts. The first part is up to 2 kms. from the reserve boundary and is most important from every aspect. The forest dependency of this area is maximum and maximum impact of the reserve is felt by these areas. There are 112 villages in this area. This area is classified as "eco-development zone". The people living in this zone consider the reserve as their resource to use and get antagonized when they are stopped from doing so. As we go further from the boundaries of the reserve, the dependency of the people on the reserve decreases but seasonal dependency on the reserve is still there. In the areas further than 2 Kms from reserve boundaries, the negative impact of the reserve is not felt much, and as a result the antagonism toward the reserve is much less in the people of the area. The presence of a protected area amongst them affects the lives of local people in various forms, which creates a negative impact of the reserve on the local people. The main issues are - an opinion among the people that development has stopped due to the presence of the reserve, like construction of roads, dams, electric lines etc. which are not allowed in the reserve. No major industry is allowed to develop in the area. Crop raiding by wild ungulates and livestock lifting by carnivore has resulted in financial losses. The restriction on entry into reserve for grazing and for other needs has resulted in loss of earnings from the natural resources, and affected their life style. Local people are not allowed to visit their religious places inside the reserve by park staff. These negative impacts of the reserve on the people, affect the very existence of the reserve and it is the management of this Zone of influence that will make or break the reserve. (Ref: Project tiger management plan 2002 - 2012). To protect and improve the ecosystem of Ranthambhore Tiger Reserve. To maintain a viable population of tigers for scientific, economic, aesthetic, cultural and ecological values. To develop Eco tourism sites away from the designated Core area. To improve productivity of grasses, fuel wood and other species in the buffer zone to reduce pressure on core zone. To reduce negative impacts of people on protected area and vice versa through Eco development initiatives in the impact zone and relocation of villages from the Project Tiger area. To develop and maintain existing corridors to encourage proliferation of wildlife. To promote socioeconomic studies and ecological research in pursuance of the above objectives. To motivate the Mogiyas and other nomadic tribes to change their poaching habits and rehabilitate them. To improve capacity of the staff through appropriate training program and strengthen the infrastructure. The Reserve is a small area which is under tremendous pressure from all directions. The main cause of deterioration is grazing of live stock in buffer zone as well as in some areas of core zone. The number of grazing cattle is very high and as a result the buffer areas of Ranthambore National Park and Sawai Mansingh Sanctuary are fast reaching to a point of total degradation. Illicit cutting and collection of fuel wood and timber is also taking its toll on the buffer areas. Mining is also disturbing the habitat in some of the areas. The noise, debris and vehicular disturbance is making the affected area unavailable to the wild life, there by reducing the net area for the wild life. The presence of villages inside the reserve and the encroachments near the reserve boundaries are also contributing to the habitat loss and reduction in net area available to the wild life. All these factors are gradually shrinking the habitat and also damaging the quality of habitat in the Reserve, which is a cause of grave concern for the management. As mentioned earlier the wildlife of Tiger Reserve is an isolated population. The destruction of corridors with surrounding forests is a grave concern for the survival of the reserve. For smaller mammals it is not very important because they can migrate to other areas or live on revenue lands but for larger mammals like Tiger, Sambhar, Chital, and Chinkara the migration to other areas has not been possible. It has created a situation in which there is a danger of inbreeding. This may lead to genetic deformities and other adverse consequences. This may also pose a serious threat to the viability of wildlife in a long run. Due to heavy grazing pressure on the areas of the Tiger Reserve, the wild ungulates are in constant touch with domestic live stock. Predators like tiger and leopard frequently prey upon the livestock. This continuous interaction coupled with comparatively small and isolated wild animal population may lead to an outbreak of a fatal contagious disease which may ultimately eliminate many of the wild species. Animals of small and uncertain populations like Chinkara, Tiger, Caracal & Sambhar are especially vulnerable to this factor. A unique feature of the Tiger reserve is that there is no entry of water from outside. All the water flows from Reserve to the surrounding areas. Thus, whatever soil is washed away from the P.A. with run-off is lost forever. This factor coupled with the pressure of grazing and wood collection is gradually resulting in the permanent soil loss from reserve. This condition may result in changes in the quality of vegetation and reduction of vegetation cover in long run, which will ultimately adversely affect the habitat quality and wild life population. The erosion of the topsoil and silting of the existing water holes is major concern. Due to siltation, the water availability to the wild animals during the pinch periods may decrease. Ranthambore has evolved through different stages. The ownership changed from princely states to Government. Through this process of state controlling the resources, the local people got alienated gradually over-a-period of time. The local population in the past had an access to forest with limited controls. After the promulgation of Forest Act and Wild Life Protection Act, the free access has been restricted. At the same time there has been growth in tourism in the Park. Most of the tourists are foreigners. They enjoy a lot of facilities and services, of course, after paying the cost. This has given a notion that the Park has been created for the foreigners and the locals have no claims. [i] Through the process of evolution of the Reserve, the local people gradually got alienated. Twelve villages were shifted from Ranthambore national park, to the outside area. [ii] The access to the forest resources has been restricted through Indian Forest Act and Wildlife Protection Act. [iii] There are restrictions on collection of minor forest produce and grazing. [iv] The mere entry to the national park is restricted, whereas the tourists enjoy all comforts and benefits. There is growing feeling that the parks had been created for the foreign tourists. The park no more holds promises for villagers. [v] The wild animals cause damage to crop and their domestic cattle. Prosopis juliflora had been a favorite species in the past in Rajasthan in afforestation activities to meet the fuel wood requirements. The Prosopis juliflora plantations raised around the tiger reserve are posing serious problem to the Eco-system. Prosopis juliflora is fast spreading into the Ranthambhore National Park, Sawai Mansingh Sanctuary and Kela Devi Sanctuary. Grazing by goat and sheep is facilitating the spread of Prosopis juliflora. An estimated 10,000 hectares area out of 130,000 hectares of total geographical area of the Tiger Reserve is infested with Prosopis juliflora. Prosopis juliflora unfortunately was not tended in the past. It has gained bushy growth devoid of thick stem, therefore, it has not helped in reducing pressure on forests where the demand is for good fuel wood or small timber for agricultural implements. The area covered with Prosopis juliflora is likely to be doubled in next 10 years. 149.5 hectares area was cleared of Prosopis juliflora up to 1999-2000. Local technology of uprooting was used with mixed results. Though there has been no coppicing, the regeneration through seeds is causing concern.